Synopsis: This mini-love-lesson first introduces competitive niceness; it then tells how it helps circular good things to happen in a love relationship; reviews how to develop this love skill; and addresses how to get past problems that might occur. Most appropriately, we were in Denmark when we first heard about “competitive niceness” (Danes are the happiest people according to national comparison research). Competitive niceness had brought Phil and Gay’s long-standing marriage much good. Gay told of how one morning she was feeling puny and Phil brought her a cup of tea without asking him to do that. She thought something like “How very nice. It makes me want to do something nice for him, and I did”. She also noticed that she felt better. Just about every morning since Phil has brought her a cup of morning tea, and has done other nice things that move her to do nice things for him – not because she has to but because she wants to. She wants to treat him as nice or nicer than he is treating her. Phil related it is a fun game they play with each other which reaps many good, loving feelings. They compete on treating each other well and it has been making them happy together ever since. Later we met some other couples who practice another version of competitive niceness. They compete with themselves to ‘out do’ their own last loving, ‘nice’ action toward one another and toward other members of their family. That seems to work wonders for all concerned. Still others compete by keeping track of their ‘nice’ acts toward those they love. They are always working on making their list of nice love actions longer and better than it was before. Competitive niceness and kindness seems to benefit whole families and friendship networks, bringing them a lot closer to one another, not to mention having more fun with one another. If I do a ‘nice, kind, pleasant’ love action towards you or for you and you do one for me, we have created a circular event of good, positive, love-giving actions. If we repeat this over and over, we create an ‘ongoing cycle’ and a ‘couple’s teamwork habit’ of cycling positive, love-giving behaviors. That can help us grow our love bonding together and help pre-counterbalance whatever might be difficult or go wrong in our love relationship later. Competitive niceness is an example of loving teamwork operating in a “I win, you win, nobody loses” style. It also sets forth good examples for children to model on. Done lightheartedly it tends to produce a lot of smiles and laughter together. 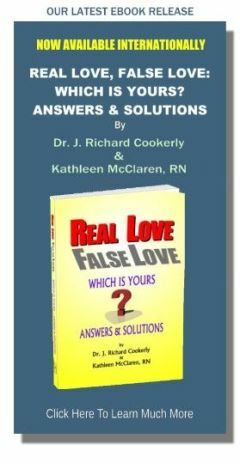 Therefore, this is an example of the kind of love skill, and the most important dynamic, which creates successful love relationships – that of mutually sending and receiving actions that convey love. We call that a circular good. Go do something nice for someone you love, maybe as a surprise. Don’t make it a big deal or be too elaborate – short, simple and quick will do just fine. It could involve a favor, a small gift, something funny or just creating a nice little experience. Enjoy thinking it up, then enjoy giving or doing it, enjoy the positiveness it creates for your loved one, and then enjoy your loved one’s reaction. You then could challenge them to do likewise, or talk over the idea of doing an additive competitive niceness with one another as a fun game to play, or you could just see what happens after your first extra act of loving niceness. Either way, keep doing daily actions and enjoying them. After several weeks of doing that, it is likely to become a good habit. Especially is this true if you both are having fun being competitively nice to each other. If right now you are a couple reading this, you might want to have a little discussion to see if you want to teamwork together and experiment with creating a joint competitive niceness game. Remember the idea is not to defeat your loved one by doing better than they do, but just to enjoy the process of being competitively nice. If your actions seem to go unnoticed, unappreciated or unreturned you have some options. You can give hints. You also could lightheartedly say that there might be something your loved one is missing or not noticing, and they might enjoy noticing it. Then make a bit of a guessing game about it. Or you could just directly request your loved one to notice, understand and appreciate certain behaviors you are doing. Be sure to say it in a happy, upbeat sort of way. It is important not to do ‘guilt trips’, criticize or blame. If they cooperate with this, be sure to thank them, praise them and maybe hug them. 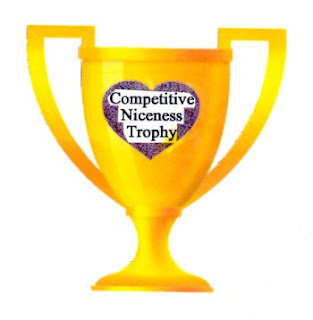 A special thanks to Gay and Phil for introducing us to Competitive Niceness! What is a nice thing you did for someone that made you feel good? Will you do it again or something like it again soon?